The house has fabulous sea views especially from the double bedroom upstairs. Direct access onto the coast path and great sandy beach made it a great location for a family holiday. Very clean and well equipped with everything we needed, the owners were extremely helpful suggesting things to do, places to visit and were very generous with an early check in. No mobile reception or internet access had pros and cons. The bay is spectacular, with broad sands, caves, rock-pools and rolling surf. It was wonderful to wake up everything morning and see such a view from french windows( that took up the whole of the side of the bedroom). With a whole series of beautiful porths along the coast one could spend each day on a different beach. Newquay is about ten minutes drive down the coast, and so the location is perfect for keen surfers. Padstow is about twenty minutes in the other direction and one can take some very enjoyable boat trips from the harbour. We had a lot of fun trying pasties from various bakers on different days and ranking them…..mmmm…. Cornish fudge, clotted cream and ice cream = happiness. Home after an afternoon body-boarding, to a clean and well-appointed property (whose owner we found to be friendly and very helpful). With the Eden Project in easy reach I have to say that we had a brilliant time! From the moment we arrived and were met by the owners this holiday was perfect. The property is clean and tidy with all the amenities we required, which for us was basically to able to cook breakfast each day as with all the wonderful eateries in surrounding area, we ate out each evening, so a real holiday for the chef of the household. The Merrymoor Inn and Fire Restaurant are a two minute walk away and further afield (5 min drive) is the The Falcon in ST Mawgan or the Travellers Rest in Trevarrian. Or here is a great suggestion, use one of the frequent buses to these two locations and you can both enjoy a drink (or two) with your meal. Tie these in with a must do experience of fish and chips at Padstow and you may come back a couple of pounds heavier but feeling soooo good. The house is situated with its courtyard garden right on the edge of the dunes, the secret path really does exist and you are on the beautiful beach in a few minutes, it is always clean and whether you want to sunbathe, build sandcastles, go rock-pooling, paddle in the surf or go all out body boarding or surfing, this beach has it all (alternatively at sunset you can take a bottle of wine to the dune just to the right of the secret path and look down on the whole bay – its breath-taking). Not having a signal for phones was a definite must for us as we both switched off from work completely and just relaxed for the whole week, we have never felt so refreshed coming back from a holiday as we did from here, this place is truly good for the soul. So much so that we came home and immediately booked again for next year. This is a great place to stay, right on the beach with stunning views and sunsets (provided the weather behaves!). The house itself was very simple but this didn’t detract from our enjoyment all. 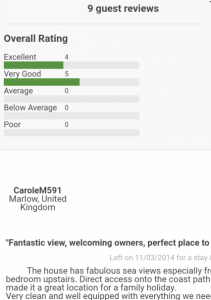 The owners are lovely and very helpful and we would definately recommend it to others. This is the 4th year we have stayed at Mawgan Porth. The location of this property is ideal for a family. As you walk out of the front door, your virtually on the beach and there’s no road to cross. No hassle of having to drive and find a car park space! (plus the added bonus of not having a car full of sand). If you have good weather, there’s no need to leave the village. The beach is great. My 9 year old could fish in the rock pools all day. It’s also lovely at night to walk down and watch the sunset. The house is basic but is very clean and tidy and has all the appliances you need and for the price we paid it was perfect. There is a lovely view of the sea from the bedroom window. There’s a crazy golf course and a 9 hole pitch and putt across the road. There’s also a convenience store, beach shop, chip shop and a lovely family pub with great food – everything you need. We will definately be returning again and would recommend this holiday home as a lovely place to stay. This was a lovely relaxing holiday. The house was in a fantastic location on the beach front, which was lifeguarded, an added bonus. Mawgan porth is a beautiful small village with a real friendly feel. Despite being a small village there was a local shop that sold most basics, a local cafe, a fish and chip shop and a pub all within walking distance of the house. As well as this there was surf equipment hire and a surfing school which comes with a great recomendation. There was also a golfing area opposite the house. As well as the local amenities we were in a great driving location for Cornwall attractions. Only 30 minutes from Eden project. Newquay was a 10 minute drive and great for more tourist based activities and night life. The house was basicly furnished which was great for what we needed. The house was very clean and tidy when we arrived. We had everything we wanted and more including TV and DVD player. The only issue we had for the week was we couldn’t get phone signal and this was not a huge problem for our relaxing week as it meant we couldn’t get bothered and if we needed to make a call it was only a short walk up the hill to get signal. I strongly reccomend this for a holiday, i will certainly be interested in returning there. 3 Sandy court is the perfect location for relaxing, sight seeing and walking. The two minute walk to the beach is great for the children. Easy to book with a very friendly and helpful owner. The accomodation size was perfect for a family of four, the house was simply furnished but had everything needed to make a wonderful holiday. The beach was magical with caves and rock pools for younger children to explore and then a great surf for the older children and having the peace of mind that life guards were on duty every day.There were enough amenities in the village that we didn’t need to keep driving to get supplies. Falling asleep at night to the noise of the sea was glorious! This holiday home is the perfect location for a beach holiday we all loved it! Had a lovely week in Mawgan Porth, I think we were lucky with the weather as sunny every day, although Mawgan Porth seems to get better weather, being on the coast. Great beach, we had our own little path through the dunes, from the back door, hardly needed the car. A great area, really central and lots going on. The Extreme Academy at Watergate sometimes features music and surf contests, on the beach.Great atmosphere, much better than Fistral, in my opinion. Will definately be returning! We had a wonderful stay here, have been coming to Mawgan Porth for 7 years now as the kids love the beach and rockpools. Lovely to see that Mawgan Porth hasn’t become over touristy like alot of other places in Cornwall. Plenty to do in the area. We just love Cornwall, especially Mawgan Porth, St Ives, Eden Project, Fowey, Minack and the beaches on the north coast. Every year there are new restaurants, delicious sea-food. The house is in the most wonderful position, overlooking the bay,5 mins walk on to beach. Had some awesome surfing, water is so clear and almost a sunset every night! The accommodation was described as basic, but we had everything we needed, friendly and smooth service. Great value, as we paid a lot more to stay in a caravan last time We have already booked next year! We booked this last minute and didnt know the area at all, we were really pleased with what we found! The garden has a small car park for the 8 houses in the little group, and then you are on the dunes down to the beach. The dogs and children absolutely loved it, with no roads to cross. The view from the bedroom window was amazing, at night you can see nothing but stars, nothing blocks the view. We visited the Bedruthan Steps, Watergate/Fistral beaches and the Screech Owl Sanctuary, we loved it all!! It is always a pleasure to have returning guests. We have pride in saying we see many of our regular customer’s returning year after year. I am pleased to say there are a number of improvements this year to the village , including refurbishment of the Merrymoor pub, expanded Deli from the store and provision of local home-made produce, dairy, the Fisha and chips restaurant with decking outside and mouth-watering food. Hotels such as Scarlet and Bedruthan have also extended their menu’s and facilities,such as swimming and spa and feast nights and craft fairs which are open to the public. Lots of local events coming up, Watergate surf relief festival St Mawgan carnival and St Columb carnival, Eden sessions,Watergate Boardmasters music concert and various surf/kitesurf events at the Extreme Academy; some exciting menu’s at Fifteen, all within 10mins drive!